The Hope Foundation is hosting a benefit Gospel Concert on Febuary 27 2014 in support of the student-project Rising Education. 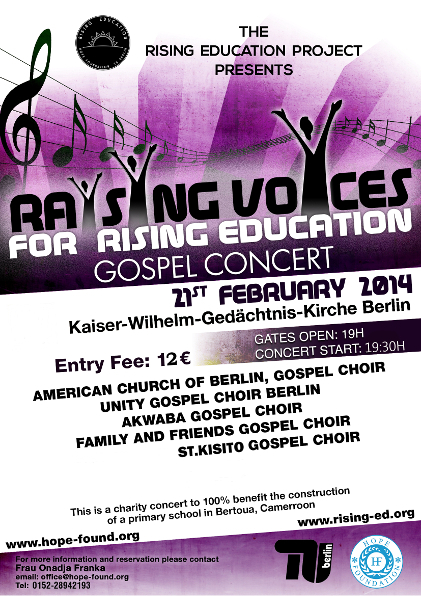 The concert Rising Voices for Rising Education at the Kaiser-Willhelm-Gedächtnis-Kirche Berlin and costs 12 euro entrance, with all proceeds supporting the building of a primary school in Bertoua, Cameroon. Visit the Hope Foundation website here! Visit the Project Rising Education here!